If you can’t decide between creamy pumpkin pie and moist yellow cake, Scentsy Go Pumpkin Spice pods have you covered. This “foodie” scent combines the fragrance notes of these two iconic autumn desserts with a handful of spiced pecans and a dollop of rich butter: a craveable scent you’ll instantly “fall” for. 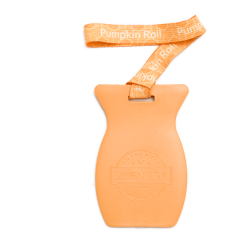 Scentsy Go Pumpkin Roll pods give you the power to enjoy decadent goodness without the temptation of keeping baked goods nearby. Special enclosed fragrance beads in every pod deliver long-lasting scent – up to 120 hours – without melting, spilling, or fading. Use one pod for a gentle scent, or double up by using both pods at once.